Dubai Business Women Council, Zayed University inaugurate ‘Emirati Young Women Entrepreneur Leadership Forum. [UAE, 29 May, 2013] – Zayed University in collaboration with Dubai Business Women Council (DBWC) inaugurated today (Wednesday, May 29, 2013), the first edition of the Emirati Young Women Entrepreneur Leadership Forum at the Zayed University Dubai Convention Center, Dubai Academic City. Organized under the patronage of H.H. Sheikha Latifa Bint Mohammed Bin Rashid Al Maktoum, the Emirati Young Women Entrepreneur Leadership Forum is being attended by speakers from DBWC who will share their experiences and offer advice to young and aspiring Emirati women entrepreneurs. Raja Al Gurg, President of Dubai Business Women Council. HBMeU showcases Middle East’s first e-learning initiative based on Facebook. 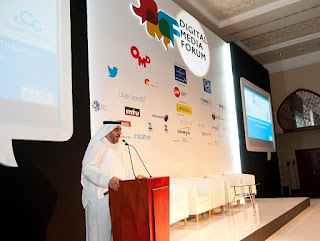 [UAE, May 28, 2013]As part of its commitment to achieve a radical change in education, which is a key component of the UAE Vision 2021, Hamdan Bin Mohammed e-University (HBMeU) recently participated in the second annual Digital Media Forum (DMF), the region’s first-of-its-kind conference which was held in Dubai with the participation of high-profile international figures from digital media and social networking. 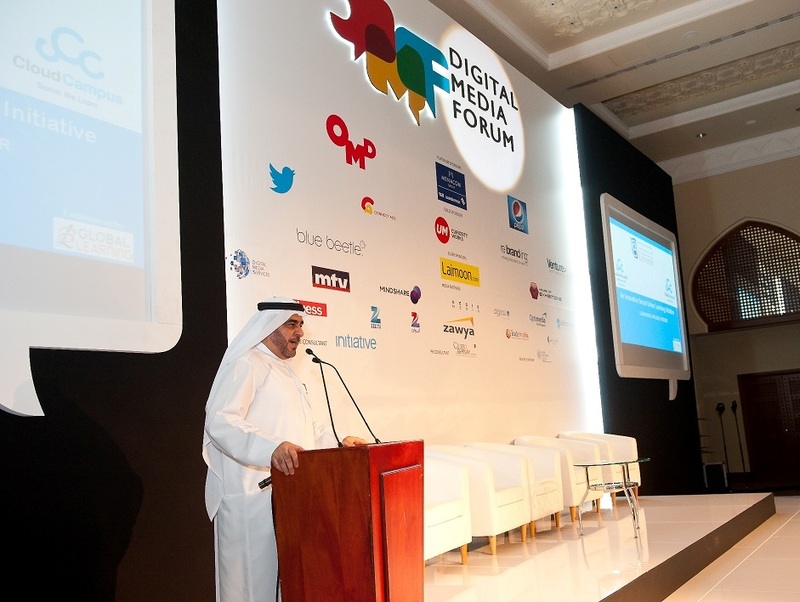 HBMeU Chancellor Dr. Mansoor Al Awar joined some of the leading regional and international experts and professionals to discuss the latest industry trends and exchange knowledge and expertise to help raise the bar of excellence in digital media. Dr. Al Awar delivered a detailed presentation on the University’s social online learning initiative; Cloud Campus, which serves as the Middle East’s first-ever e-learning platform based on Facebook. Talking about the platform’s operating mechanism, Dr. Al Awar explained that the initiative provides e-learning services through the learner’s personal account on Facebook, under the highest standards of excellence and quality to reach a larger segment of learners in the Arab world and allow them direct access to Arabic online content to help create positive changes in local communities. Dr. Al Awar further added that the Cloud Campus initiative draws upon an integrated concept that promotes contemporary, world-class learning for learners of different nationalities and age groups by offering them a convenient learning environment and an innovative and interactive e-learning experience under the supervision of senior professionals providing all levels of support and academic advice. Dr. Al Awar further shed light on the University’s strategic offerings, ranging from the various certified programs to financial aid and scholarship schemes and programs. HBMeU’s Chancellor pointed out the educational, social and cultural aspects of the Cloud Campus initiative which aims to promote social responsibility, encourage the young generation to optimally leverage the available online interactive platforms and information resources and reinforce the culture of e-learning among the youth, in line with the directives of H.H. Sheikh Hamdan Bin Mohammed Bin Rashid Al Maktoum, Crown Prince of Dubai and President of the University, to reach as many learners as possible in the UAE, Arab world, Africa and Asia. The goal is to effectively contribute to re-shaping the future of education through creativity, while also contributing to sustainable human and social development in the region and worldwide. 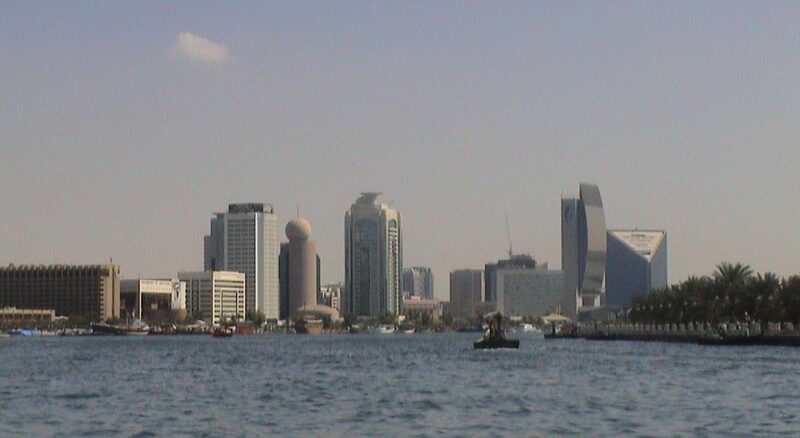 To enable millions of clients and employees to use social learning services, Hamdan Bin Mohammed e-University has maintained close partnerships with leading banks, mobile operators and other institutions in the Middle East, Africa and South West Asia, such as, Emirates NBD, Sharjah Islamic Bank, Abu Dhabi Islamic Bank, ARAMEX and Zain Group. On the sideline of the forum, Dr. Mansoor Al Awar held a meeting with Guy Yalif, Head of Global Product Marketing, Twitter, US, to discuss the cooperation between Hamdan Bin Mohammed e-University and Twitter. Cloud Campus initiative is the result of a strategic partnership with Global Learning S.A.R.L and offers best international curricula with over 1,200 interactive online lessons in the fields of mathematics, sciences and IT for elementary to secondary grades. It also includes business skill development for adults, providing 10 certified programs in Leadership, Entrepreneurship, Communication, Talent Development, Operation Management, Marketing, HR Development, Islamic Banking and many more. There are also more than 600 online lessons in English language for all age groups, from 3 year-olds to adults, based on the Cambridge curricula and exams. [UAE, May 21, 2013] – Building on its position and efforts to set new standards for the provision of integrated and interactive learning platforms, Hamdan Bin Mohammed e-University (HBMeU) celebrated the launch of its new e-book club in a special ceremony recently held at its campus and attended by the university’s department heads, faculty members and staff. To commemorate the launching of the new initiative, HBMeU presented attendees with copies of the Arabic version of ‘Flashes of Inspiration,’ a book written by H.H. Sheikh Mohammed Bin Rashid Al Maktoum, Vice President and Prime Minister of the UAE and Ruler of Dubai. The token gesture reflects HBMeU’s eagerness to keep its academic and administrative staff informed and apprised of the vision and drive of the UAE’s leadership to forward academic excellence and improve the quality of education in the Arab world. English speakers who were present during the launch were presented with copies of ‘My Vision,’ a book also written by H.H. Sheikh Mohammed that offers a detailed account of the vision that transformed Dubai and the UAE on the global economic map, based on knowledge economy and investment in human capital. According to HBMeU, the presentation of the books demonstrate the university’s continuing move to provide employees with comprehensive and integrated references that can be used to help drum up the march towards excellence and leadership—achieving new breakthroughs for learning and aid in the preparation of a generation of young people who are socially and academically qualified to lead the country to more growth and development. Al Awar added that the token presentation of ‘Flashes of Inspiration’ and ‘My Vision’ is in line with the university’s commitment to adhere and remain inspired by H.H. Sheikh Mohammed’s vision for leadership, management, excellence and future challenges. Al Awar also urged HBMeU’s academic and administrative staff to adopt an approach to excellence in terms of self and institutional development, which in turn, can help enhance the position of HBMeU as a leading University for e-learning in the Arab world and the first academic choice in the UAE and beyond. “The e-book club initiative represents a massive addition that supports our constant endeavor to keep abreast of the latest developments in the world of modern technology and employ them optimally to transfer knowledge and establish a culture of excellence and quality management in the UAE and the rest of the Arab world,” said Al Awar. The e-book club holds strategic importance as an exclusive initiative based on cutting-edge technologies and advanced interactive channels such as blogs, videos, and others. The club provides its Arabic and English-speaking members with the opportunity to review the latest scientific research, literary, monetary and educational releases, as well as exchange views and constructive ideas in an interactive environment that conforms to international best practices. Members must be active and participate effectively through comments, opinions or published materials. Membership to the e-book club will be cancelled automatically in the event of non-contribution for a period of three months.